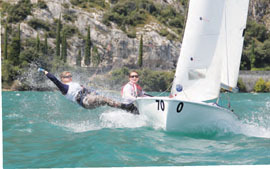 An International 420 skipper from Darien, CT, Megan Grapengeter-Rudnick is one of America’s finest youth sailors. Megan was recently named (for the second consecutive year) to the US Sailing Development Team (USSDT), the Olympic pathway team supported by the U.S. Olympic Sailing Program and US Sailing’s Olympic Sailing Committee. She’s also among the best writers ever published in WindCheck. Her excellent articles, including “Sailing, Surfing, Empanadas and Car-Diving: Opti Racing in Argentina” and “Wind and Warmth: A Winter I420 Campaign Across Florida,” are archived at windcheckmagazine.com.